Always start with a clean, moisturized and primed face. Taming your brows begins the framing of your face, so we first fill in and shape brows with the Maybelline Master Shape Eyebrow Pen. The spoolie wand on the end of this pen makes taming brows a breeze! 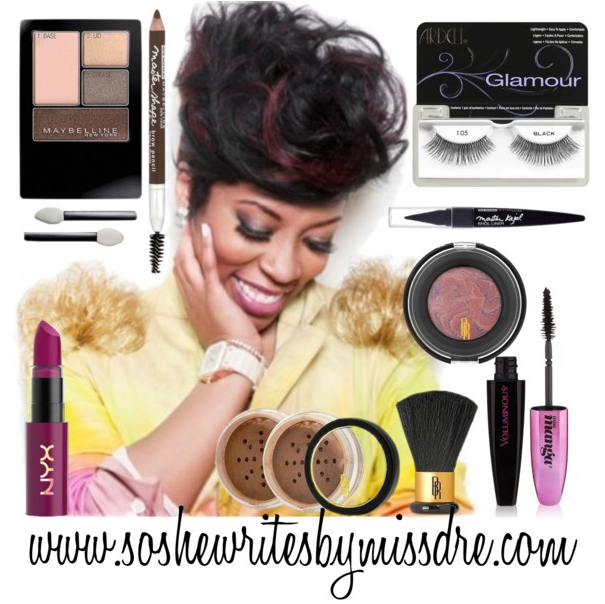 To create a subtle smoky eye like K. Michelle's, use Expert Wear Eyeshadow Quad in Autumn Coppers. This quad is perfect for a natural, neutral eye. It even instructs you on which shade to apply to each part of your eye to create a perfect finished look. Remember to blend each of these shadows to eliminate harsh lines. And for extended wear, apply primer to your lids before applying eyeshadow. Apply L'oreal Voluminous Miss Manga Mascara to the lashes and add a bit of the Maybelline Master Kajal Eyeliner in Pitch Black to accentuate your lashes. If you're like me and sometimes have trouble lining your eyes, this small liner's size and defined tip really helps to create a thick, yet precise line. For a flawless, natural complexion, apply Black Radiance Perfect Blend Mineral Foundation to your face (and neck if needed). Apply a flush of Black Radiance Artisan Baked Blush in Plum Sorbet to the apples of your cheeks. To finish up the look, add an application of NYX Butter Lipstick in Hunk to the lips. Now, you have a simple celebrity inspired look that could be worn for any occasion!